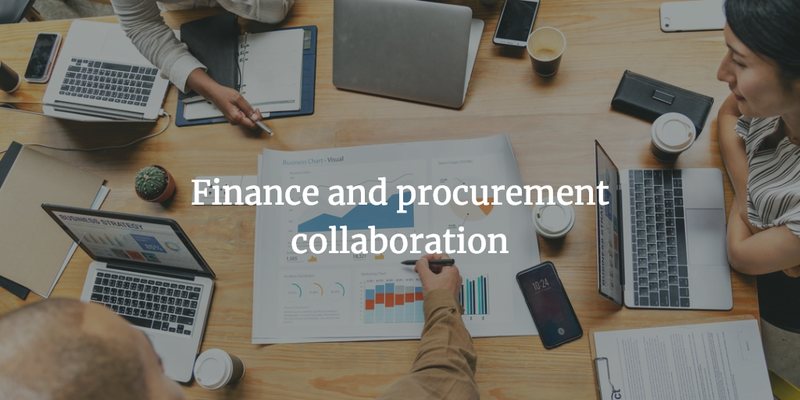 Procurement and finance collaboration has been an interesting topic for many years now. As the maturity of the procurement function increases, procurement becomes more involved with the finance team in yearly planning, ensuring savings goals are aligned and delivering shareholder value. But having said that, it is not the case across all organizations. 1.Why the need for procurement and finance collaboration? 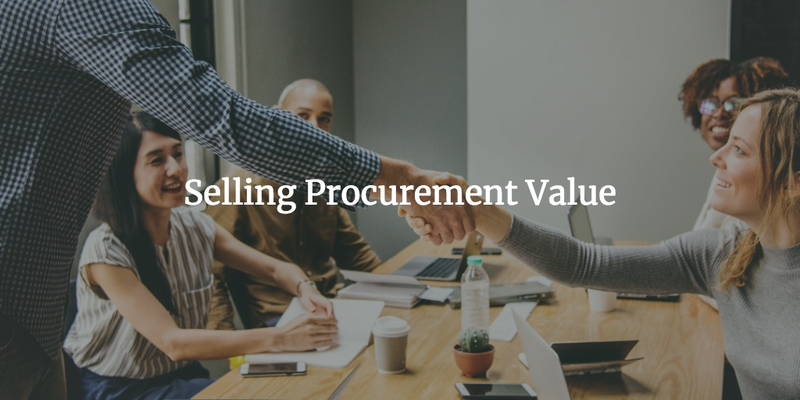 Procurement has been a mature function in larger companies and these companies understand the value proposition and procurement is treated as a value-added partner. But what if, your procurement team has no or limited collaboration with the finance team. What if you are working hard on finding savings but the budget owners don’t care because they are not incentivized to save but to meet the budget numbers. What if procurement is not involved in the financial planning process and that leads to very tactical involvement with the business. What if procurement is viewed as a cost function and not a source of great value. What if you are starting a procurement organization within a company, where the current focus is just ensuring that Purchase orders are processed on time. If you are facing these challenges, you are not alone. As per the 2018 Deloitte CPO survey, 6% of respondents assess their effectiveness to be poor. And 70% assess their performance as fair but the majority of them are still striving for excellent performance where procurement is regarded as value-add partner. The point to notice is that 70% of the respondent companies have revenue of more than $1bn, where you would expect procurement maturity to be high. But they are still struggling with engagement and being engaged at the right levels with the business. We are not presenting these numbers to scare the reader but to make a point that the problem is widespread. The good news is that procurement teams across the globe are working on improving their collaboration with finance and business in general. Why we focus on finance only? You must be asking that why we are focusing only on finance, isn’t increasing collaboration requires working with all the stakeholders in the company? We agree with that assessment, engaging stakeholders is the key to enhancing procurement value in the organization. 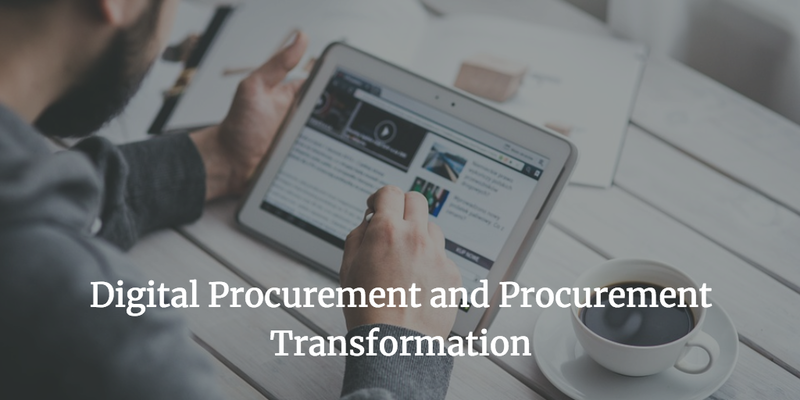 But the basic premise of this assumption is that procurement value add is well appreciated by finance and now you are working on increasing procurement influence. 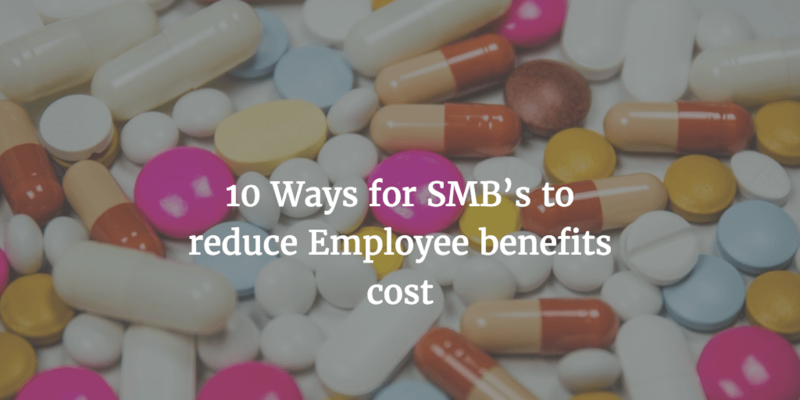 Cost savings is the not the only value add procurement can provide. But if you are trying to establish the value of procurement, that is, of course, the obvious point to start. That’s why we recommend starting with finance and that is what the rest of the blog post is all about. Increasing the collaboration with finance to drive better procurement value. 2. Benefits of finance and procurement collaboration? This is a good question to ask because that makes you quantify what the collaboration means and how would you measure whether the collaboration is increasing or decreasing. 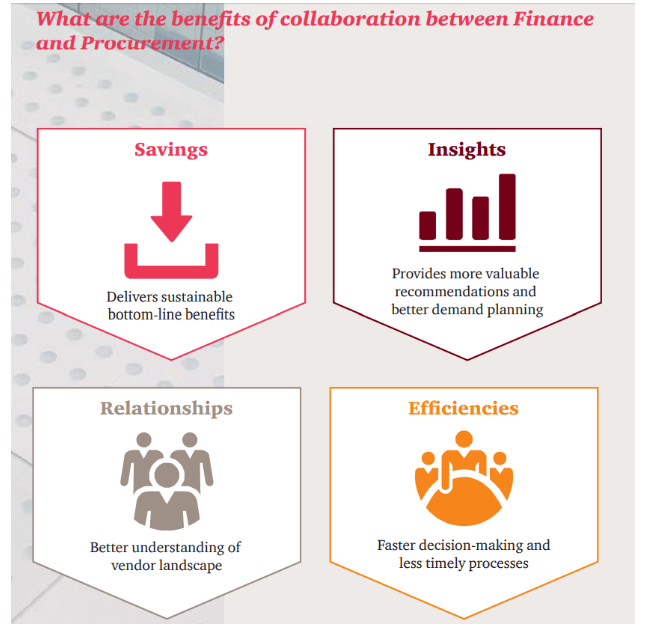 PWC recently did a survey to quantify the benefits of procurement and finance collaboration. That is, of course, the obvious outcomes of the collaboration. If the procurement team is delivering savings but they are not being booked by finance then you have not created any value for the organization. By working together, procurement and finance can ensure that savings are reflected in the bottom line. 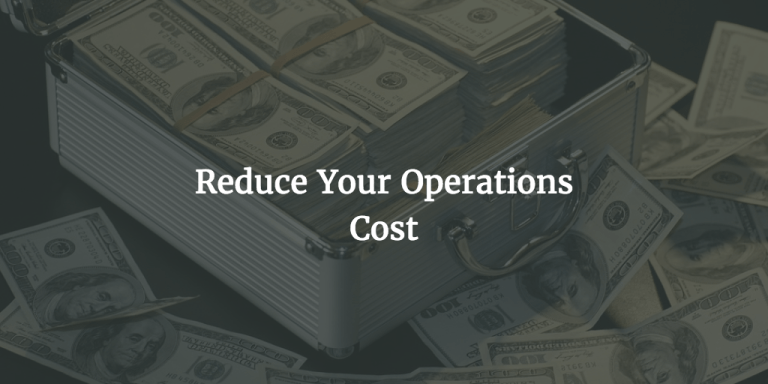 The cost reduction could be Opex reduction which impacts EBITDA (Earnings before Interest Tax and depreciation and amortization) or Capex reduction which impacts the cash flow. 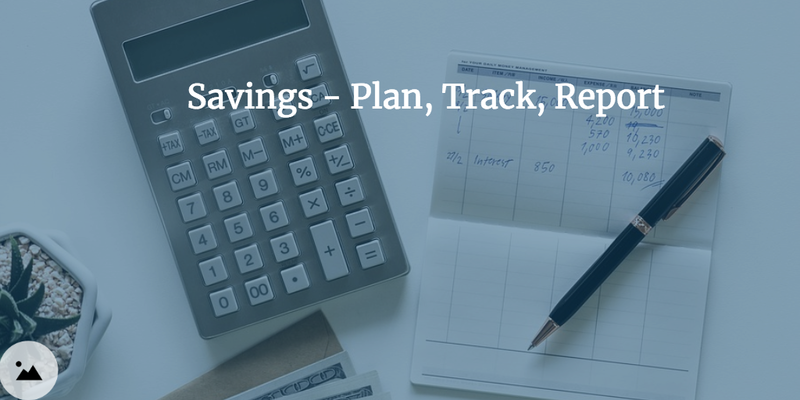 When you are trying to sell procurement value to your organization, it is important to establish a cadence of reporting savings and ensuring both teams (procurement and finance) agrees on the booked savings. When it comes to delivering sustainable value to the bottom-line, you not only need collaboration with finance but your stakeholders also need to agree that their budgets can be adjusted for the cost savings. Procurement and finance can collaborate to provide better data for overall planning. Especially to support the yearly planning cycles. If you have detailed spend data, then that can help the finance team to better understand the spend instead of relying on the stakeholders all the time. Finance teams and specifically CFO’s are involved with not just the buy side of the house but the sell side of the house too. They are continuously evaluating business cases for new investments or business cases for customer specific investments. 1. They can identify where the same company is vendor and customer too. This leads to better engagement and building a strategic relationship with your customers. 2. Your finance team can keep an eye on your big vendors and help you mitigate the supply chain risk. For example, you might not be tracking all the financial information about your suppliers, but your finance team might be more close to this information. In the end, it is beneficial for the entire organization to understand who the key suppliers are and their criticality for the entire supply chain. 1. How are we doing against the budget? 2. Spend forecast for a specific type of budget, for example, professional services. 3. Historical spend data for a vendor. The end goal of the finance organization is to provide information to support the decision-making process for their stakeholders. By joining hands, finance and procurement teams can identify areas for improving efficiencies around supporting stakeholders needs. You could probably use a common platform like a procure to pay system to provide the information to your stakeholders. 3. 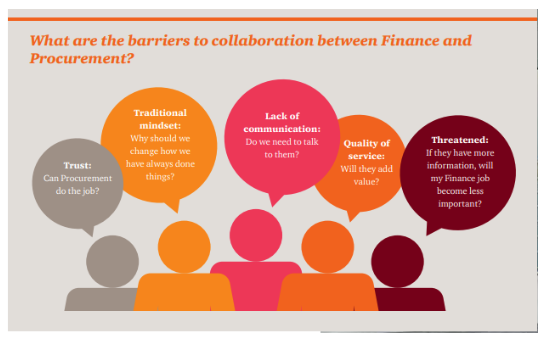 Barriers to finance and procurement collaboration? Some finance teams are very skeptical about the value procurement brings to the table. There could be many reasons for that, primarily being lack of past collaboration. For example, a procurement team has been reducing cost but there was no impact on the bottom-line. That could be because of most of the savings being soft savings or the savings never got booked. So for your stakeholders, you are adding a lot of value but for the finance team, there is no or limited value-add. If the finance team have a better understanding of procurement value-add, that would increase the trust level between both teams. In terms of communication, the message should be the same as any other stakeholder but here the focus should be more on the hard saving and increasing EBITDA. How often you talk to your finance counterparts? If you answered never or not very often, then that could be one of the reasons for lack of collaboration between both teams. On the surface level the day to day job responsibilities for both teams are very different but if you think about the end goals, it is pretty much the same – Increasing shareholder value. The more often the teams communicate, the better it is because both teams understand each other requirements and that leads to better collaboration. 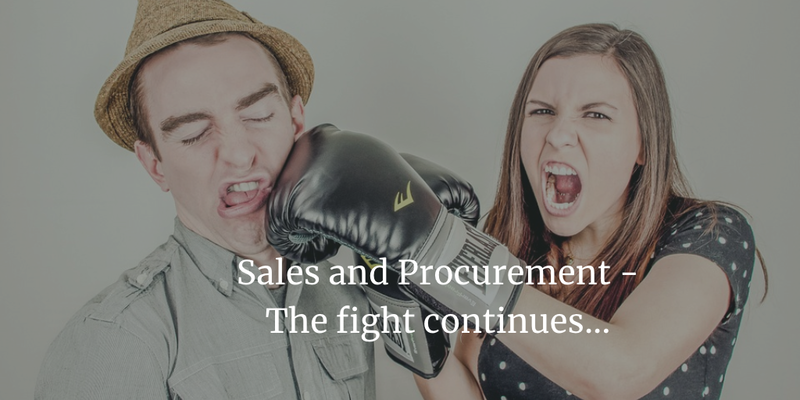 With finance and procurement functions being so different, it is hard to imagine that the finance team would feel threatened by their procurement counterparts. So on the surface of this, it seems absurd that why finance team would feel threatened by procurement. Let’s evaluate why that might be the case. Finance teams work with their stakeholders (assigned department owners) to help then budget, provide visibility into spending and answer any questions they might have. Now if your pitch is that we can provide enterprise level spend visibility so that your stakeholders can view their own spending information or answer key questions then some finance team members might feel less important. The reality is that if budget owners have information at their fingertips, they would call finance less for trivial questions. Rather now finance team has more time to look at analysis and trends and help their stakeholders with long-term planning questions. Procurement needs to look at finance as a partner or a stakeholder and then suit the communication cadence accordingly. Clear and regular communication is critical for increasing collaboration between procurement and finance. 4. Increasing finance and procurement collaboration? Start with the CFO office but before we you get started, you need to understand the priorities of the CFO office and then find a way to align procurement goals with that. It is important that you understand CFO persona’s because that would help you in proactively understanding their priorities. What do I mean by CFO personas? As the name suggests, this CFO persona is heavily finance focused. What that means is that they are coming from a strong finance background and have spent their career in managing functions like treasury, audit etc. Some of them could have advanced finance degrees or public accounting background. Needless to say, they have a strong focus on process and compliance and very well suited for organizations who are trying to set up a finance function or operationalize the finance function in terms of compliance and processes. They are well suited for stand-alone business unit or startups. Generalist CFO’s are operations focused. Their careers not only includes the finance department but they have often spent time in different operations departments likes marketing, general management etc. It is not uncommon to see that these CFO’s are MBA’s or have a combination of accounting and finance degrees. They have a strong focus on company strategy which is backed by strong domain expertise, industry knowledge, and competitive information. They are well suited for a capital-intensive business like telecommunication, oil and gas etc where strong operational experience is required. These CFO’s have strong experience in playing transformation roles across their careers. That means they have experience in transforming business and transforming different teams which they have managed in their tenure. They are highly analytical and are dependent on metrics and dashboard for decision making. They are highly focused on optimizing any function they look into. For example procurement or finance. They are strongly focused on cost reduction and optimizing the performance through performance improvements and investments in technology. These type of CFO’s are well suited for diverse companies who have businesses across different geographies. The growth champion is focused on the growth of the company. That could come via Mergers and acquisitions or strategic divestitures which can unlock the value of the company. They are generally externally hired and they are brought on to transform the business. That makes sense because they bring along their diverse experience across different companies. They are well suited for companies who often are cyclic in nature and are being constantly disrupted by the changes in environment or competition. A good question at this time is how do I know by CFO persona? Just keep this in mind, that every CFO persona would be a mix of each of the personas we mentioned above. You would always have a dominant persona which is of course driven by the CFO background. For example, a growth champion is generally focused on M&A activities, it doesn’t mean that they don’t care about compliance. If you are working in a small or mid-market company, it might be easier to schedule time with your CFO. if you are working in a large company, it might be easier to adopt the next strategy. What should be your request? If CFO has already published the goals which are accessible to everyone, then go with specific questions about those goals. Do your homework before the meeting before your meeting. For example, if you know that the finance team is working on reducing cost then a natural question would be to understand the specific focus areas for cost reduction. In case you are working in a large company or your CFO is not accessible for some reason then ask your manager. If you are already reporting into CFO’s office, then this should not be a problem. Otherwise, ask the department Vice President on what are the stated top goals by CFO team. 99.9% of the time these goals are the organizational goals. Now based on the answers to your questions, you can easily identify the CFO persona. For example, if they are heavily focussed on compliance or they talk a lot of compliance to policies being number 1 priority then the CFO persona is “The Finance expert’. You can look at other personality traits to identify the correct persona. So now you know the personality of your CFO. What do we do next? The idea behind knowing your CFO is not so much about knowing their persona but the persona drives the priorities. These priorities help you design a strategy to align procurement to support that strategy. As we mentioned earlier, Finance expert persona comes from finance, audit or even treasury background. 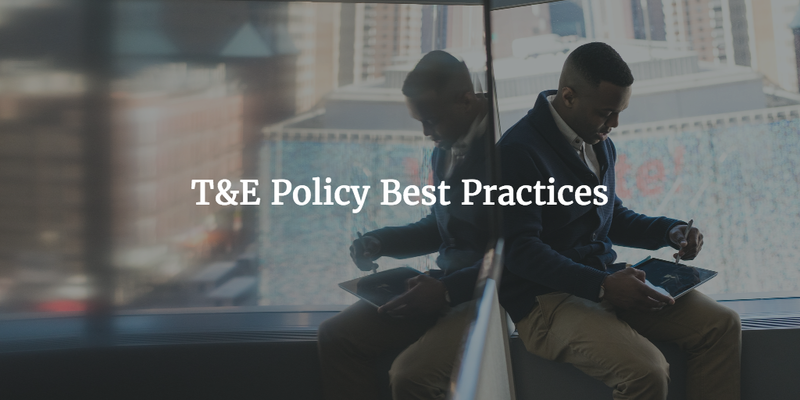 A common theme would be a strong focus on compliance with policies and different regulations set up by different governing bodies. So this persona would be highly focused on ensuring compliance with policies and spend control. So what can procurement do to help this persona? Focus on how procurement can help drive compliance with the defined spend policies. Whether it is pre-authorization of spend or contract signing authority. Ensuring that proper controls are followed gives CFO’s assurance that they can meet their audit requirements. If you are achieving these controls manually, that is great but you could always automate these controls by implementing a purchasing system. Generalist persona is focused on improving the operational performance of the company. Given their background across multiple departments, they have a strong view of all functions of the company and how all cohesively fit together to deliver value for the company and its stakeholders. CFO always cares about compliance but the generalist persona also focus on enabling different departments and not just compliance. So what can procurement do to help this CFO persona? It is obvious that only compliance focus will not garner the interest of these CFO’s. Here procurement should be on the enabler for the organization. Let me elaborate, every department needs to purchase product or services to run their operations. The nature of the product or services provided could vary from department to department. So instead of projecting procurement as an enforcer of policies for compliance, present procurement as an enabler for the entire organization. Procurement can free up the time invested by employees in finding new vendors or working with existing vendors. That free up the time for the entire organization which can help drive an increase in productivity. As we mentioned above performance leaders are very analytical and highly focused on increasing operational efficiency wherever possible. They would have a strong focus on simplification of processes, automation and decision support systems. Their ideal scenario would be that the entire organization decision-making process is data based. They are analytical and emphasize on metrics driven, objective performance measurement for the company. What can procurement do to help this CFO persona? Automation and visibility are the two main selling points for a performance leader persona. That is first and foremost and the rest of the items like compliance, risk etc. is taken care of. You should answer the following question for a performance leader persona. How can procurement enable enterprise visibility into spend and how that can help decision making not only for finance teams but for the entire organization? – Highlight the procurement performance metrics like Spend under management and what does it mean when it comes to increasing cost savings. – What spending trends you can identify based on the data you have. Not just who your top suppliers are, they are table stakes but what is YOY growth on important categories. What is the CAGR for the last 5 years on your top 2 categories? And if you can tie that to revenue and show the trend, your efforts will be certainly appreciated. Growth-oriented persona is focused on unlocking the shareholder value. They are generally brought on when the business needs drastic changes or the industry trends are too volatile to have a steady organic growth curve. We think procurement can be a better value-add by supporting the decision making process around mergers or divestitures. Let’s say your company is looking at acquiring companies to grow inorganically. 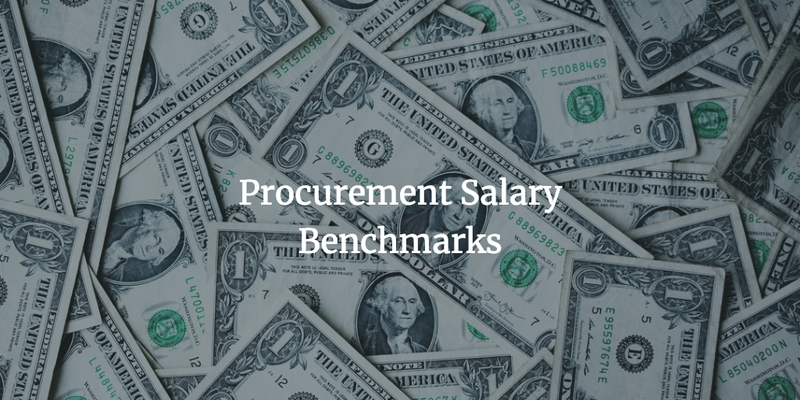 Procurement can help in quantifying the synergies by understanding the vendor overlap and how the increased volume would drive better leverage for the company. When companies merge, the market and shareholders expect synergies across the board – which includes reduced third party cost. By helping to quantify those savings, you can help the CFO team to better assess the feasibility of synergies targets they have in mind. In a similar fashion, in case of sale of a business unit, you can help quantify negative synergies. Negative synergies are the leverage you would lose with your existing vendors due to decreased Spend. We hope that understanding CFO personas and how to work with each persona would help drive increased collaboration with procurement and finance. In this section, we cover some basic areas which every procurement team can add value to the finance teams. According to CPO rising one of the ways procurement can increase collaboration with finance is helping with cash management. Both procurement and finance teams should become highly competent in cash management and that requires strong collaboration with the teams. As you all know, cash flow is the lifeline of every business. If a company has positive cash flow, it can invest in new growth opportunities and increase the value for its shareholders by paying dividends or share buy backs. Depending on how complex or simple your supply chain is, it could be a daunting or simple task. 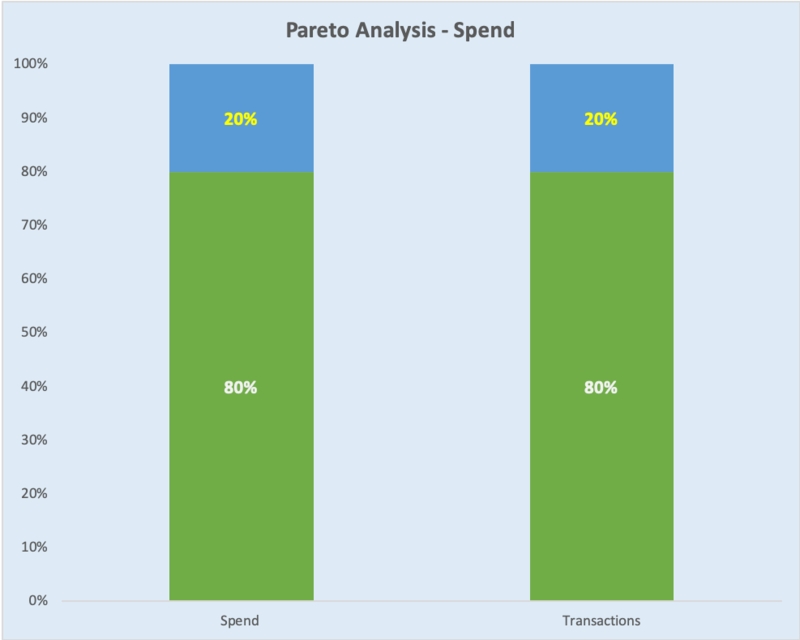 A simple Pareto analysis would help understand the concentration of spend. For example, if 80% of your spend is with less than or equal to 20% of suppliers, then you know that focussing on 20% can drive desired results. 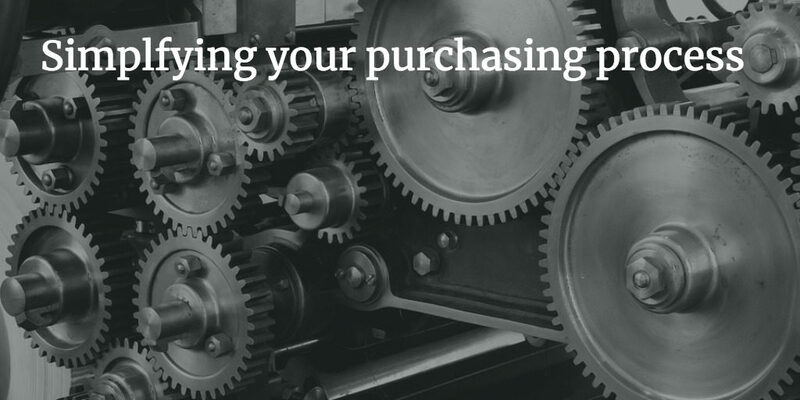 But if your spend is spread out across a large number of suppliers then that need more time and effort. Extending payment terms is not an exercise in isolation, it is very important to understand what concerns your stakeholder might have with this approach. For example, you have a few critical suppliers who are small in size. Extending payment terms for those suppliers could have serious results including supplier going bankrupt. Now bankruptcy might be an exaggeration but if you understand your supplier profile and what % of business is contributed by your company then you are in a position to have a more educated conversation with your stakeholders. The key is to address your stakeholders concerns before you aggressively start pushing extending terms with your suppliers. The other area where procurement and finance can collaborate is on reducing working capital requirements. Let’s focus on one aspect of working capital which is inventory. The less inventory a company carries, lower the working capital requirements for that company. Following are two common approaches for reducing inventory and decreasing working capital requirements. One of the reason companies carries more inventory on their books is that they have higher lead times or the lead times are not highly predictable. Sometimes companies get better discounts by purchasing items in bulk and hence they are carrying more inventory. Whatever the reason is, procurement can work with the logistics team and inventory planners to better understand the scenario and then work with to help reduce the inventory by working with suppliers. The suppliers better need better forecast and that alone could drive down the lead times. Sometimes the suppliers could decrease the lead times if you order in bulk assuming you can spread the deliveries across different months. The other solution for decreasing inventory is to purchase products from a distributor and having them hold the stock for you. That can ensure that products are available when you need it without the need to carry a large inventory of products. That, of course, comes at an increased cost but sometimes it could reduce cost because distributors have buying leverage which you might not have as an individual buyer. Whatever the case, always do a total cost analysis to calculate landing cost. Procurement lives in the world of categories and finance teams live in the world of books / General ledgers. Procurement looks at cash out of the door, finance looks at that too but more focussed on budget vs. actual. Or in case of operating expenses, accruals from a better forecasting perspective. Now if procurement reports on cash basis and finance teams report on an accrual basis then the reporting would never match but that is not the purpose of spend reporting. Spend management is looking at long-term trends and identifying opportunities for cost reduction and not necessarily looking at budgets vs. forecast. The data available in ERP systems are highly summarized or in other words not very granular. You can easily run a report where you can summarize the spend by General ledger codes (GL) or by the vendor but it is missing is line item invoice details. Essentially, the answer to “What are we spending money on” is generally a few clicks away and sometimes involves looking at individual invoices. Procurement and finance teams can collaborate to bridge this gap by aligning their reporting needs. If you can connect the GL data to the line item data available in Purchase orders or invoice then that provides a coherent and detailed view of the spend for any stakeholder in your organization. Procurement and finance collaboration is not a nice to have but a must have for any procurement team to add value to the organization. But wishing for it is not going to help, what would help procurement is taking charge and initiatives to increase the collaboration. 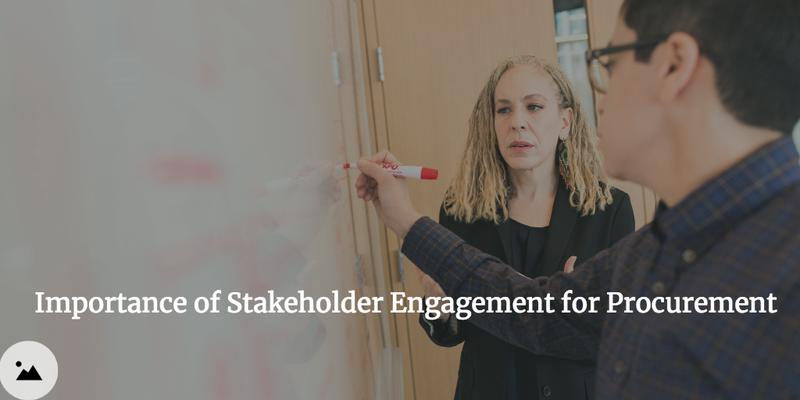 Start treating finance teams as just another stakeholder and drive better stakeholder engagement.